An anonymous Northern California couple out walking their dog recently discovered six rusty canisters buried on their property. The canisters were filled with 19th century gold coins, worth about $10 million today. Who's responsible for that much buried treasure? You might just be looking at him. Several theories have emerged about the Saddle Ridge time capsules. But one of the most compelling is the story of Walter N. Dimmick, the chief clerk at the San Francisco Mint from 1898 until 1901. 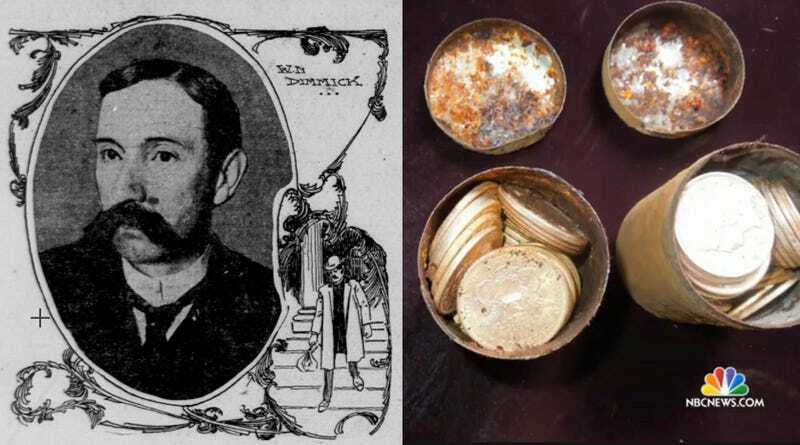 After a June 29, 1901 audit revealed that $30,000 (about $815,000, inflation-adjusted) in gold coins were missing from the San Francisco Mint's vaults, Walter N. Dimmick, chief clerk at the Mint, was arrested for embezzling the coins. Dimmick was actually tried three times; one resulted in a mistrial, and another found him guilty of misdemeanors unrelated to the case. When Dimmick was finally convicted of the felony larceny charge he was sentenced to nine years in San Quentin prison. Dimmick's last trial, though, was a messy excursion filled with accusations of jury intimidation, witness coaching, and government conspiracy. The most damning testimony was that of a Secret Service agent who claimed Dimmick confessed to the crime. Agent William J. Burns testified that Dimmick had told Burns he would return the coins in exchange for not being charged. Dimmick denied these charges and said no such conversation ever happened. He wasn't without his supporters. The August 9, 1908 Oakland Tribune claimed Agent Burns had been caught tampering with juries using "hired bandits whom [Burns] calls detectives." The paper even said that one of Burns' men got into a fistfight with a juror over the fact that he was constantly trailing and harassing jury members. Dimmick had powerful allies as well; President Wheeler of the State University even made a clemency plea to President Teddy Roosevelt in 1908. So was it Dimmick who stole and buried the money? A corrupt Secret Service agent? Or was it something else entirely? We may never know for sure, although there's some evidence that whoever buried the coins worked for the San Francisco Mint, since they included special coins that were never in circulation. One coin in particular that was found in the stash—an 1866 Liberty $20 gold piece that didn't include the words "In God We Trust"—leads some historians to believe that it probably implicates Dimmick or someone in a similar position. "This was someone's private coin, created by the mint manager or someone with access to the inner workings of the Old Granite Lady (San Francisco Mint)," historian Jack Trout told the San Francisco Gate. "I don't believe that coin ever left The Mint until the robbery. For it to show up as part of the treasure find links it directly to that inside job at the turn of the century at the San Francisco Mint." Dimmick appealed to the California Supreme Court in the fall of 1903 because he'd been in jail since 1901 and argued that he had served his time. It's not clear why he was arguing that he had only been sentenced to two years, since other newspaper accounts of the time had it at nine years. Countless people are coming out all over the world to claim that the coins are somehow theirs. But unless they want to claim Walter Dimmick or some possibly corrupt Secret Service agent as their long lost uncle, they're probably out of luck.